Do you struggle with applying liquid foundation with a brush? Keep reading so that you guys can learn how to apply foundation with not one, not two, but three different foundation brush types that are super beginner friendly and that will give you a flawless look. Also, make sure you guys scroll to the end of this post, I have an exclusive freebie video that only you guys will have access to. 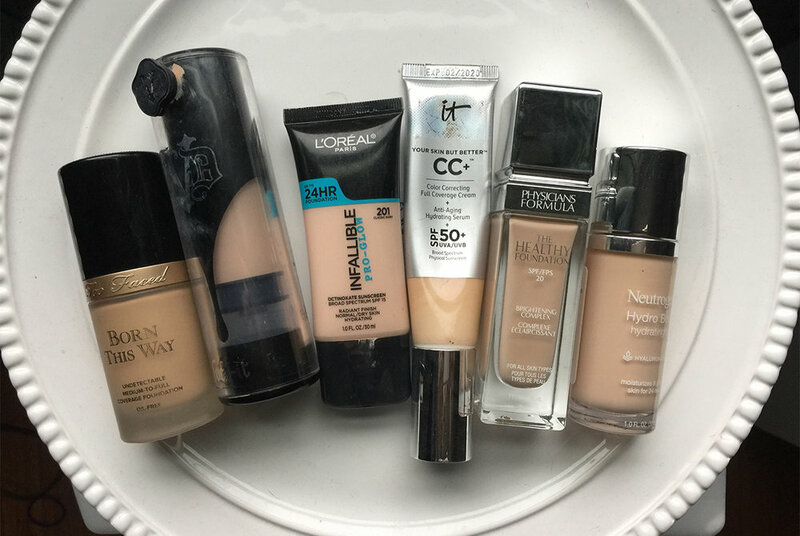 Choose the foundation that best matches you from when you guys read my previous post on how to actually match foundation to your under tones as well as your skin tone. If you guys did not check out that post, make sure you click this link or scroll back one post to last week! Again guys, you ideally want to choose a liquid foundation that best matches your under tones, your skin tone, as well as your skin type. Meaning if you guys are dry, if you're oily, combination, normal, you want to choose a foundation that meshes the best with your skin type. 2. Choose the brush that you want to use for your skin type. The video above includes a demo all of the types of brushes from my previous post, so you guys can see exactly how to apply your foundation and so you can decide for yourself which brush type you think will work best for you. 3. Now you're going to pump at least a pump to maybe about a pump and a half of foundation either on the back of your hand or onto an empty makeup palette if you guys don't necessarily want to get your hands dirty. *** I'm not sure if you guys know this or not but if you guys like to recycle things one of the best empty palettes is an unused candle lid from Bath and Body Works that I'm just going to toss anyways once the candle runs out. I make sure that I wash it so that it's completely clean and I use this as my empty palette when I don't want to get product on the back of my hands or on my fingers. From that pumped out product, you're going to want to start dotting the foundation onto your face. Again, with completely clean hands and clean fingers, I cannot stress that enough. You can add a little bit more product in the areas that you find that you're having a little bit of trouble with breakouts, with redness, or anything like that. Trust me, there is no wrong way to do this. If you feel and look ridiculous, you're probably doing it exactly right! 4. Now you're going to begin to apply the foundation with your brush of choice. For the flat foundation brush, you'll actually want to work in downward strokes on your face so you're not leaving any definitive lines. You'll just kind of start going over the product again and again until it blends into the skin really seamlessly, not leaving any streak marks or lines behind. For a flat top or round kabuki brush, what you're going to want to do is start stippling or dabbing the product onto your face and into your pores. What it's going to do is allow the foundation again to sink in without actually creating any of those harsh brush strokes or lines on your face. With a stippling brush, what you're going to want to do is go back and forth with this stippling or dabbing motion, as well as some circular buffing motions as well just to really work the product into the skin. While this brush here is probably going to give you the lightest coverage, I do not recommend it for super dry skin types like I mentioned in my previous post because this brush will cause your skin to flake up much more than it would unless you use a kabuki brush or even a flat foundation brush. That's it guys, now you know how to apply foundation with your three different beginner friendly brush types. But what if you guys actually want to apply foundation with one of those infamous beauty blenders you guys have been hearing so much about? That's why I've created this exclusive bonus video for you guys showing you exactly how to apply foundation with a beauty sponge now instead of the brush. Make sure you guys click on the link to watch how to apply foundation with a brush vs a sponge first though! Also, make sure you guys stay tuned for next week's post. I'm going to be showing you guys how to actually make that beautiful foundation you just applied all over your face with beginner friendly brushes stay all day long! If you guys liked this post, leave me a comment down below. You guys can do it, I promise! Also, make sure that you share this post with anyone else that struggles with using a foundation brush in their normal makeup routine. Also, make sure that you guys include #simplymakeup in the comments if this post helped you out in any way, shape, or form. I’ll catch up with you guys next week!